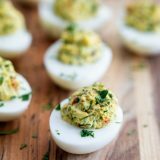 Green olives with pimento are the secret ingredient to these Green Olive Deviled Eggs that are a great change up from the traditional deviled eggs. A big dose of fresh herbs adds to this easy appetizer. Use a fork to break up the yolks. Add the mayonnaise, mustard, relish, parsley, dill, and hot sauce. Stir to combine, then season to taste with salt and pepper. Use either a piping bag fitted with an open star tip, or a ziplock bag with the corner cut off to pipe the filling into the egg whites. If desired, garnish with additional parsley and dill.